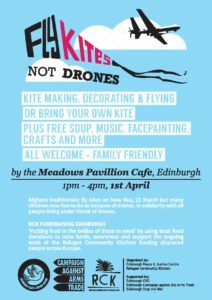 Join us again for our fun, family friendly day full of kite making, decorating and flying, in solidarity with those affected by militarised drones. Delicious soups and live music, provided by Refugee Community Kitchen. More activities to be confirmed. 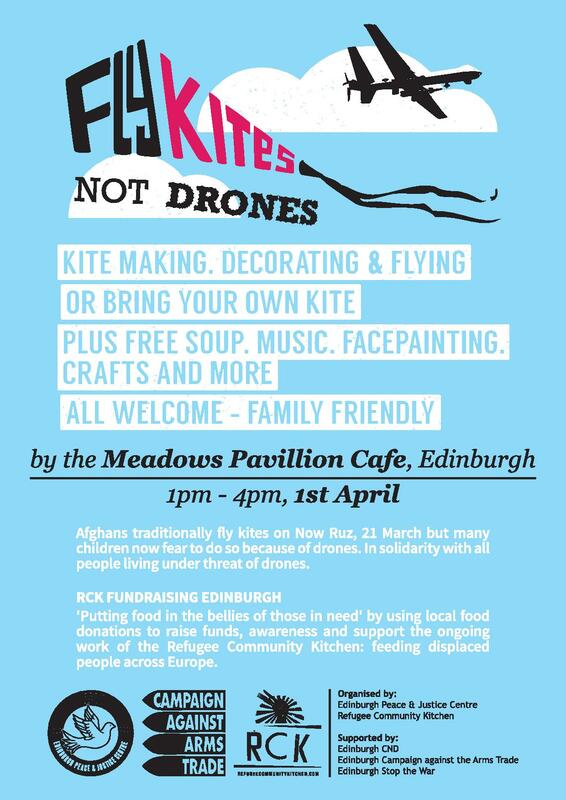 Fly Kites Not Drones is a protest against the increasing use of armed drones and the danger they pose to civilians in conflicts from Somalia to Afghanistan. Initiated in Afghanistan by the Afghan Youth Peace Volunteers, FKND is now a global project to educate youth about the harms of militarised drones. We will be joined by Refugee Community Kitchen Edinburgh Fundraiser – ‘Putting food in the bellies of those in need’ by using local food donations to raise funds, awareness and support the ongoing work of the Refugee Community Kitchen: feeding displaced people across Europe. Mohammed Asif, who is from Afghanistan and now living in Scotland will give a short talk in one of the rooms in the Pavilion, for the over 14s, on the ongoing conflict in Afghanistan.